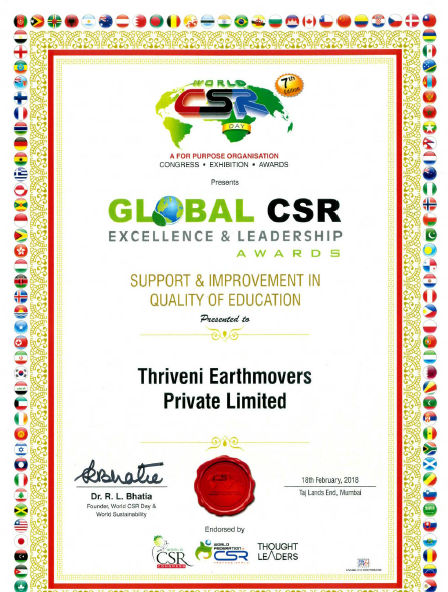 Thriveni Earthmovers has been awarded by WORLD CSR CONGRESS in Global CSR Excellence & Leadership Awards for its Excellence CSR Works in “Support and Improvement in quality of Education” held on 18th February, 2018 at Taj Lands End, Mumbai. Our priority goes for the societies we touch. The Thriveni Public School extends quality education to tribal children. We support many schools for infrastructure building, additional teacher appointments, mid-day meals etc. Vidhya Bhawan, Thriveni’s another venture which is a residential school for children from BPL families, destitute and orphan children in the tribal belt of Kundaposi, Keonjhar. Thriveni provides financial assistance towards infrastructure development and boarding, lodging of approx. 300 students of the school from the inception of the School the High School Board result has been 100% . Advasi Vikas Samiti was founded in the year 1978. The aim of AVS is to provide quality education to children from down-trodden sections of the society. Thriveni is committed towards supporting this noble cause by providing running grant for the school and helping the students get their basic educational rights. Since its inception in Jan 2011 Thriveni Public School has always focused on the less privileged children and providing an opportunity to imbibe the quality education. This is a No Fee school for the BPL family children of Kendujhar, where School provides free education, study materials, uniform, transport and mid-day meals. The School with Nursery to Standard IV has 112 students from the local tribes. The institute is designed to develop into a full-fledged residential Higher Secondary school soon.